It is a product that has been created from scratch in very close corporation with our customer. The system architecture is fully defined by FPGA Solutions. Hardware design is done together with one of our partners. Other tasks, like FPGA design, embedded software and PC software implementation have been done 'in-house'. The system is in full production. 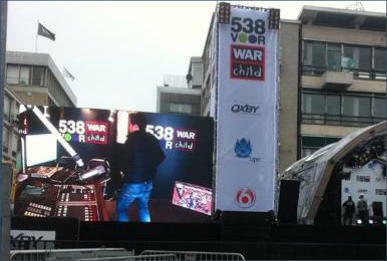 The LED displays with our control system are installed throughout the world. LEDs are far from perfect to apply in a display. Brightness and color reproduction heavily depends on the current, temperature and age. Furthermore, LEDs need to be binned (selected) to prevent large brightness deviations. Most LED display control systems don't have any correction options built-in. FPGA Solutions has developed a modular LED display control system (for indoor and outdoor displays) with the possibility to connect a measurement camera system to calibrate the display. The result is perfect image quality, at least as good as the best High-End displays in the market, but at a much lower price level. The system has all the features a professional system should have, like an automatic brightness control with many options to connect multiple light sensors and a selectable gamma correction. Multiple PWM LED drivers are supported with a bit depth up to 16 bits. Drivers with programmable current outputs are fully supported. The FPGA designs are all protected against cloning, overbuilding and reverse engineering. The system components are a DVI controller and multiple transceiver boards that are mounted in the LED cabinets. The DVI controller connects the digital video signal (from a computer or other video source) and the Gigabit Ethernet wires to the LED cabinets. The system has double (redundant) wiring so that when a single connection fails the display continues to operate as it should. The controller continuously monitors the status of the LEDs, power supply and temperature of each transceiver board. The heart of the controller is the Xilinx XD3S400AN FPGA. 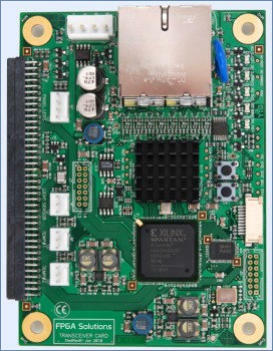 Digital video enters the FPGA via the DVI receiver TFP401A. 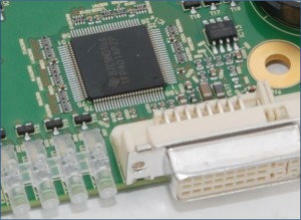 This chip converts the serial DVI stream to video and synchronization signals. In the FPGA the video images are cropped and converted to Ethernet packets. These packets are send to the transceiver boards inside the LED cabinets along with the control packets. The embedded processor inside the FPGA takes care of all communication with the transceiver boards, internal and external Flash memories, the DNA module and the on- board temperature sensor. To setup the controller a PC can be connected with a RS232 serial port. On the transceiver board the Xilinx XC3S400AN is also the main component. Ethernet data goes in and out via the dual Gigabit Ethernet PHY and is stored temporary in external PSRAM memory. Inside the FPGA the intelligent video processing is executed, like gamma correction and matrix calculations for correcting the LEDs. The RGB data comes out in a serial format in 8 channels to feed the driver boards. Each transceiver card is capable of driving 128x128 pixels (each pixel normally has 3 LEDs - Red, Green and Blue). To support all kinds and brands of LED displays a modular 80 pins connector is used so that customers can connect to their own custom connectors. The system, which has been developed for a Dutch customer, gets the most out of professional LED displays for use in stadiums, events and advertising boards. It is a complete system solution for LED display manufacturers that can be used to improve the color and brightness uniformity of all kinds of LED displays.